TAG GON KIM received the B.S. and M.S degrees in Electronics Engineering from Pusan National University, Korea, and Kyungpook National University, Korea, in 1975 and 1980, respectively. He received his Ph.D. in computer engineering with specialization in systems modeling/simulation from University of Arizona, Tucson, AZ, 1988. He was a Full-time Instructor at Communication Engineering Department of Bookyung National University, Pusan, Korea between 1980 and 1983, and an Assistant Professor at Electrical and Computer Engineering, University of Kansas, Lawrence, Kansas, U.S.A. from 1989 to 1991. 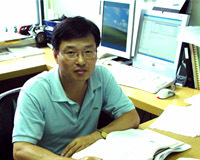 He joined at Electrical Engineering Department, KAIST, Tajeon, Korea in Fall, 1991 and has been a Full Professor at EE Department since Fall, 1998. His research interests include methodological aspects of systems modeling simulation, HLA-compliant simulators interoperation and development of simulation environments. He published more than 150 papers in M&S theory/practice and tools/environments in international journals and conference proceedings. He was the Editor-In-Chief for Simulation: Transactions for Society for Computer Modeling and Simulation International(SCS). He is a co-author of a text book, Theory of Modeling and Simulation , Academic Press, 2000, which is the most frequently referenced book in M&S area recently. He is very active in defence modelling and simulation in Korea. He was/is a consultant for defence M&S technology at various Korea government organizations including Ministry of Defence, Defence Agency for Technology and Quality(DTAQ), Korea Institute for Defence Analysis(KIDA), and Agency for Defence Development(ADD). He developed a tools set, call DEVSimHLA for HLA-compliant wargame models development, which has been used for development of three military wargame models for Navy(Chunghae), Air Force(Changkong) and Marine(Chunjabong) in Korea. He was the President of The Korea Society for Simulation (KSS). He is a Fellow of SCS, a senior member of IEEE, a Certified Modeling and Simulation Professional by National Training Systems Association (NTSC) in U.S.A, and a member of Eta Kappa Nu.